Nintendo had a solution to help Timmy get his Gyromite. 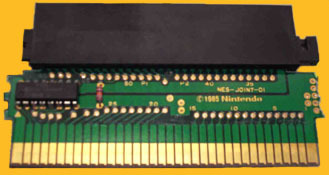 Instead of using the regular 72-pin NES boards in games to be released in the United States, Nintendo combined 60-pins Famicom boards and 60-to-72 pins converters inside their gray NES game shells. And so, Nintendo saved Christmas for lots of eager NES children all across the land. And, little did Nintendo know, but those same boards continue to be a godsend for video gamers. Today, those same NES carts are searched out and raided of their converters, for with them they bring the glory of Famicom games to the NES. Sure, there are generic 60-to-72 pin converters available, but the ones within NES games are those only ones Nintendo ever released. Finding these titles is as good a starting place as any when looking for your very own NES 60-to-72 pins converter. But, even if you find one of these games, it’s not guaranteed to have a converter. To help you further, consider this: NES games from the list above with converters inside are always five-screw, meaning that instead of three screws and two tabs holding the gray shell together, it’s five screws (and no tabs) holding the shell together. And instead being those darn star-head hex screws you need the special bit to open, games with converters can be opened with a tiny flathead screwdriver. Another way to ensure a cart from the list has a converter inside is to take a look at the pins. A NES board’s pins are different from a converters pins. If you’ve got a regular NES cart, each pin will be symmetrical, meaning if you drew a line down the center of the pin it is the same on both sides. If you’ve got a cart with a converter, the pins will not be symmetrical. Instead, the pins will slight bit of gold pin on the bottom left of each pin, but not on the bottom right (hence, not symmetrical). Another way to tell which games have converters inside is with by the weight of the game, though this is much more difficult. The weight of a game without a converter is much less than the weight of a game with a converter inside. Some people are able to feel the difference by placing a cart with a converter on the palm of their hand. Also, most of the weight of a cart with a converter is nearer the bottom of a cart, which means it will balance more toward the bottom of the cart than regular cart. This should start you on your way to finding some great converters, which, if found, can usually be sold for more than the game itself is worth. The only Famicom-to-NES converter released by Nintendo.